This page provides problem-solving advice and ways to make your yard less attractive to coyotes in the first place. For more information on these mammals, including what they eat and where they live in the forest preserves, visit the main coyotes and foxes page. Survival for coyotes is difficult, and some may instinctively see domestic dogs — their close canine cousins — as competitors or threats. This can be especially true if a dog is small (smaller dogs tend to be more aggressive toward larger canines) or if a dog’s yard falls within a coyote’s territory. In some cases, a coyote may try to eliminate a perceived threat or take a smaller dog as prey. There have been reports of coyotes chasing or attacking dogs during the day, even dogs on leashes, but these confrontations are uncommon and are often initiated by the dog and not the coyote. Still, it’s wise to take a few precautions. Like domestic dogs, coyotes test their limits around humans and learn something from each exchange. Unless they associate people with negative experiences, such as loud noises, they can become comfortable walking down streets or sidewalks or near schools, basking in yards or parks, and shortening the distance between themselves and humans. If you’re on a trail that coyotes often use, carry an air horn, whistle, walking stick, cane or other deterrent. If you’re followed by a coyote, don’t panic. It’s likely escorting or “shadowing” you through its territory, keeping a calm eye on you to ensure you don’t bother its den. If a coyote approaches you, be big, loud and bold. Wave your hands above your head, or hold your jacket wide open. Shout or use a whistle or horn. Don’t turn your back or run; calmly walk away facing the coyote. Keep yourself between coyotes and children. 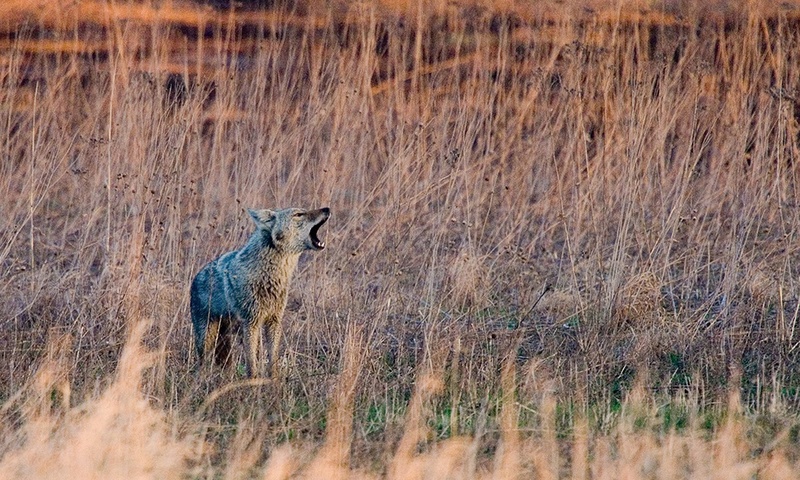 If a coyote becomes aggressive — snaps, growls or snarls — throw sticks or clumps of dirt at the ground by its feet. Aim for its body if necessary but never its head. Report aggressive behavior on private property to your local municipality. Report encounters in a forest preserve to the Forest Preserve District at 630-933-7200. Coyotes avoid people when they can, but loss of habitat makes it difficult. You can prevent problems in your yard, though, by removing two main attractants: food and shelter. If possible, keep garbage cans inside. Use sealed compost bins, and never add pet waste, meat, milk or eggs. Protect vegetables with heavy-duty fences. Use welded wire to block access to areas under decks, sheds, patios and porches. Clear overgrown bushes and dense weeds. Use deterrents such as sirens or motion-activated lights or sprinklers. As a precaution — but never a guarantee — install a 6-foot chain-link fence, and bury an extra 6 inches underground. Install rollers at the top so coyotes can’t pull themselves over. Encourage neighbors to follow these steps. It’s illegal to keep wild animals, even for a short time. They have special nutritional, housing and handling needs, and inexperienced individuals who try to raise or treat them inevitably produce unhealthy, tame animals that can’t survive in the wild. Coyotes are not a public health concern. Domestic dogs bite nearly 900 people in DuPage County each year, but the county does not have one documented case of a coyote biting a human. In other parts of the country, most cases occurred after people were feeding the animals. Coyotes may carry rabies, but there have not been any recent reports in DuPage County. Although transmissions are uncommon, they may also carry distemper, sarcoptic mange, heartworm and other canine diseases, so always keep pets’ vaccinations current. If you find a wild animal that looks injured or orphaned, leave it alone and call the Forest Preserve District's Willowbrook Wildlife Center at 630-942-6200. Recordings offer general advice when the center is closed. Or visit the wildlife rescue advice page.